It’s safe to say that virtual reality headsets are probably the consumer electronic gear of the year. It sounds genuinely out of this world. But to ground things a bit we thought as part of the Foresight Project we’d monitor the Australian Public’s current attitudes towards virtual reality. Attitudes will likely change quickly once people get to experience VR for themselves, but it felt to us an appropriate time to see how people were feeling just as we’re poised for the VR revolution. In some way life will never be the same again. And of course, it gives some interesting strategic insight into the challenges and barriers facing VR in its early stages. We’ve listed below some of the things we found to be interesting and insightful from the data. People seem to have absorbed the fact that virtual reality is an exciting and significant development, even if they’re not that up to speed on it. There’s a generational divide. Perhaps unsurprisingly those aged in their mid-40s or younger are more positive and keen to adopt the technology than older people. Excitement about VR peaks amongst younger, wealthier males. The statement that receives the strongest level of agreement amongst women is that “virtual reality technology will have an isolating and antisocial effect” at 60%. By contrast, for men it ranks fifth. On the whole concerns about the negative impact of VR tends to be shared across age groups. 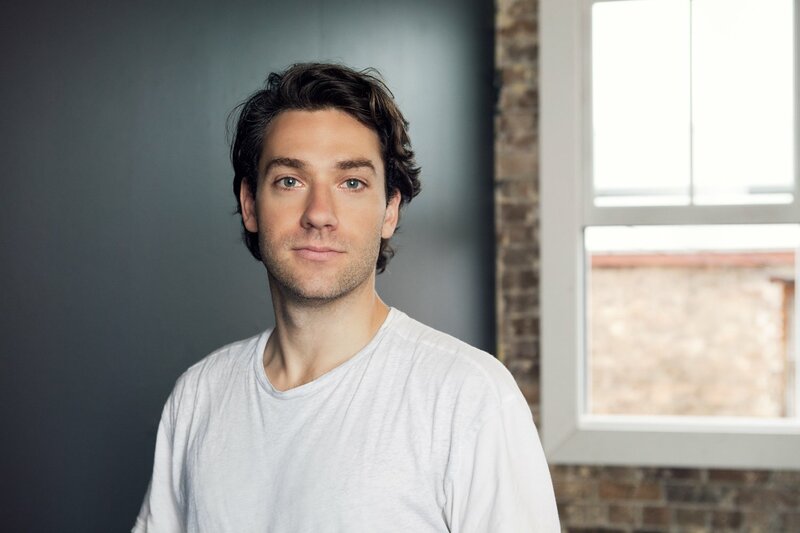 Young affluent men are an obvious and natural fit for VR. They are receptive and eager to adopt it. So if your brand has something to offer this audience then great – embracing virtual reality would seem to be an opportunity. Virtual reality’s Achilles heel would appear to be its potentially isolating and anti-social effect, particularly for women. The technology, generally, and female-targeted branding, specifically, might have to work hard to convince women of its relevance to them. This feels like a significant barrier for the technology. While the public generally get that VR is significant and exciting, they are still cautious about its net benefits. This might change with experience and familiarity, but at this stage mass marketers shouldn’t confuse their enthusiasm to embrace the new technology with their audience’s enthusiasm for using it. People don’t need convincing that virtual reality is about more than gaming, and even if they don’t know that much about it, on the whole they get that it’s an exciting, significant thing. Somewhat unsurprisingly, enthusiasm for Virtual Reality technology is driven by younger people. But it does beg the question how can Virtual Reality technology engage a broader constituency who arguably stand to benefit from it just as much? Will Virtual Reality come to be stereotyped as ‘boys toys’? Young, male, higher household income. 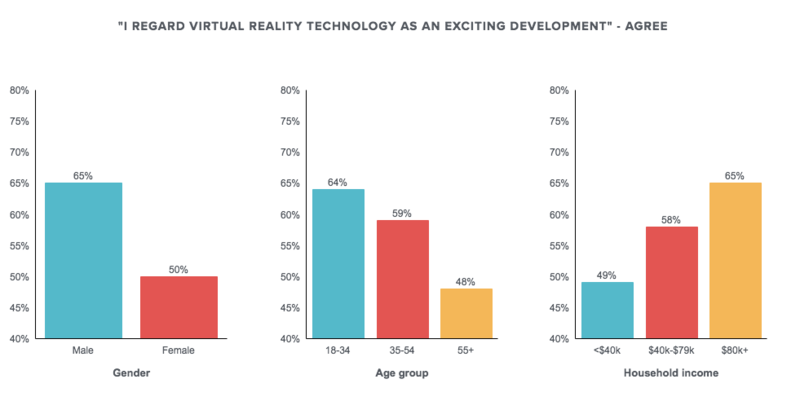 These are the three demographic groups most enthusiastic about Virtual Reality currently. Perhaps there’s a risk that Virtual Reality could be stereotyped as “boys toys”. Does VR need a strategy to attract women? Virtual Reality needs a strategy to attract women. Currently they regard it as having a potentially isolating and antisocial effect, quite markedly so. If anything this seems to us to be Virtual Reality’s greatest barrier. Reservations and concerns about the technology seem to be shared across generations. It’s not an age thing and shouldn’t be thought of as such. 1. I consider myself to be up to speed with what’s going on with virtual reality technology. 2. I regard virtual reality technology as an exciting development. 3. Virtual reality technology is something I’m keen to adopt in my day to day life quite soon. 4. Virtual reality technology is hyped and overrated. 5. I think more good than bad will come from virtual reality technology. 6. Virtual reality technology will have a significant impact on the way we live our lives. 7. I believe virtual reality technology will have an isolating and antisocial effect. 8. Virtual reality will only be for gaming and not much else. 9. I’m excited by the broader benefits virtual reality technology can bring to society.